The Smith® MBA-30510 medium duty welding and cutting outfit features quality construction throughout and is built to provide reliability and extended service. 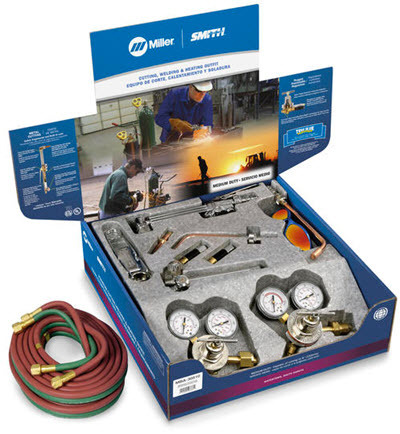 This oxy/acetylene torch kit comes with Smith's proven in-tip gas mixing technology. 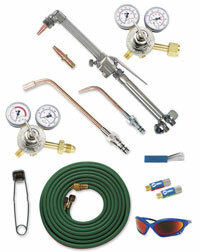 This combination greatly improves operator safety and increases torch life. 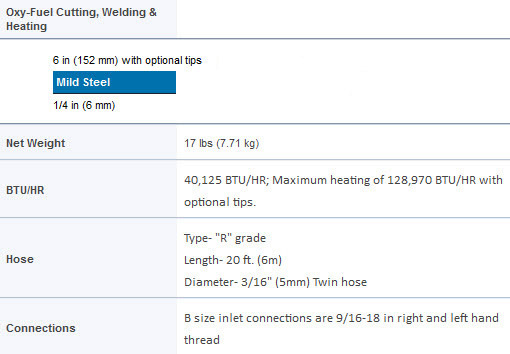 Torches are covered by Smith's True Blue® LIFETIME WARRANTY, the longest and strongest in the industry. The outfit features rugged, highly accurate regulators. Regulators are backed by a 3 year limited warranty. Outfits come complete with safety and operations manual. If your tank valve has female threads, you should choose a CGA 510 (male) regulator. Note: will not fit "B" or "MC" acetylene cylinder. Arrived fast as always. Packaging in great shape. Product was exacted as advertised. Better price than anywhere else. Torch, regulators etc works fantastic. Nice balance.